Sad news from Washington State this weekend, after a major landslide killed several people near the town of Oso. We’re hoping the missing are soon accounted for and are alive and well. 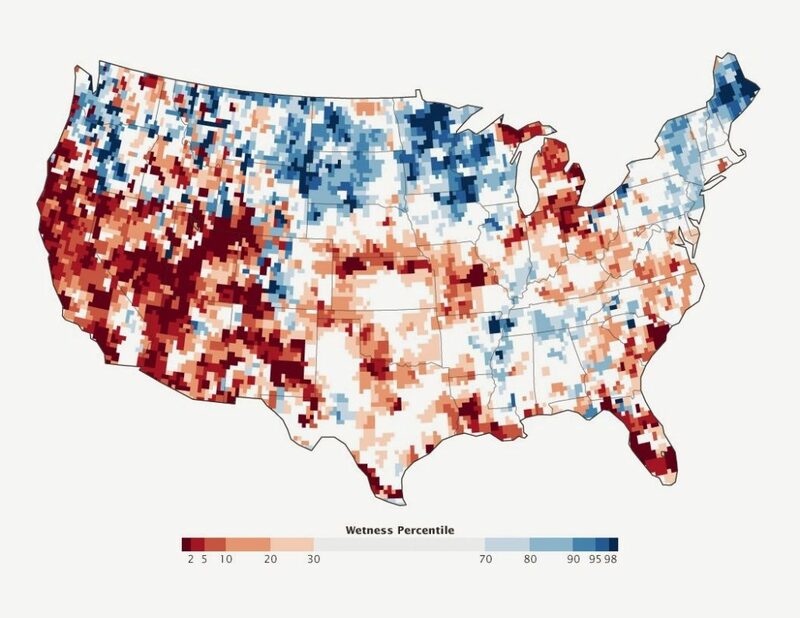 Geologically speaking, landslides are commonplace throughout the Pacific Northwest which mostly sits on a thick pile of unstable layers of volcanic ash, tuff, and debris flows that are regularly shaken by earthquakes. Site of fatal landslide as it looked in 2005. 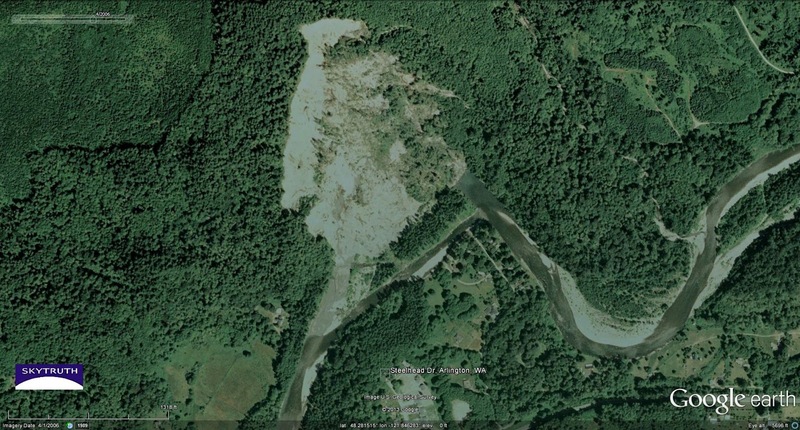 Steelhead Drive, where several homes were hit by the flow of mud and rock, is marked for comparison to this annotated air photo of the slide area. Same area in 2006, after a slide that occurred in January 2006. 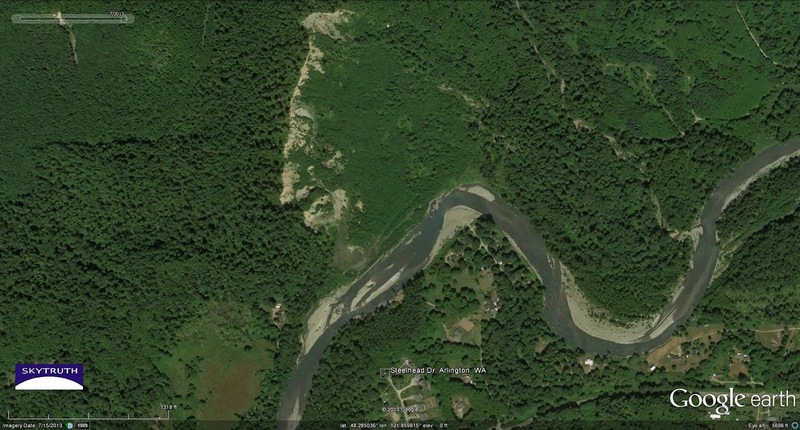 Bright area is bare rock and soil exposed by the slide, which temporarily dammed the North Fork of the Stillaguamish River. Same area in 2007. 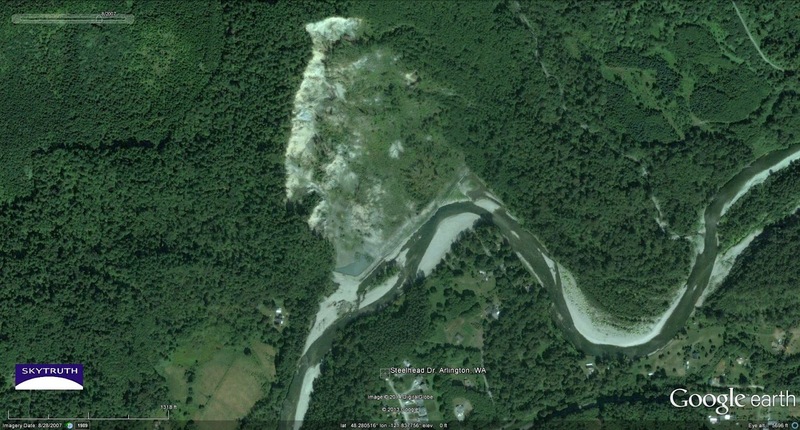 Vegetation is beginning to cover the landslide debris, and the river is adjusting to the new channel. 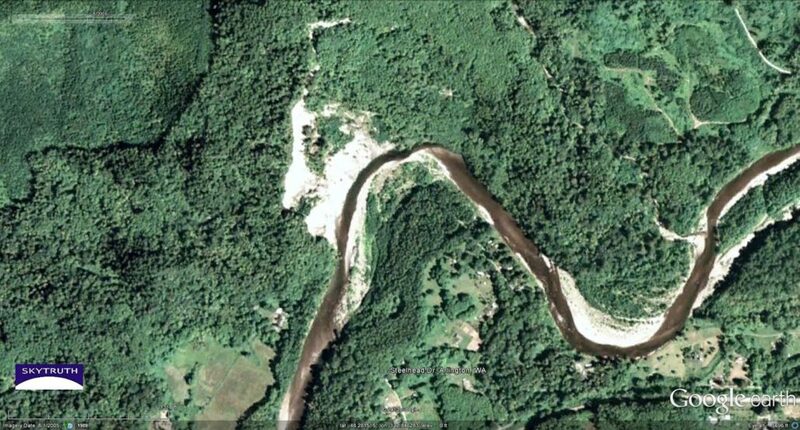 Hydraulic pressure from the river is maximized along the outside edge of a meander bend, tending to undercut the landslide debris on the north bank of the river. Same area in 2013. New growth covers most of the 2006 landslide, but the headwall escarpment (bright area of bare rock) remains unstabilized and prone to failure. 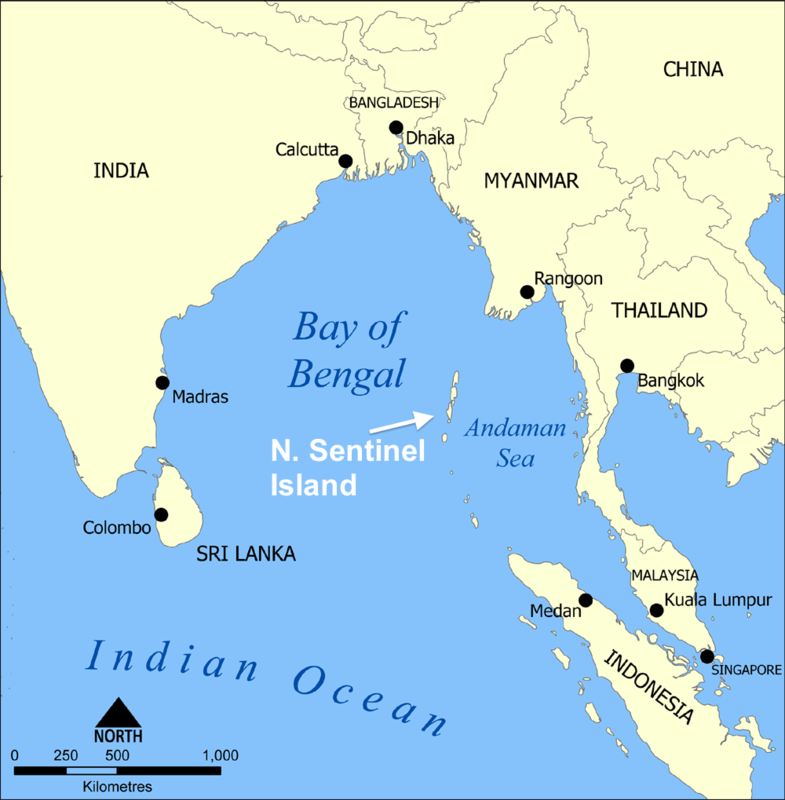 [Updated] Are Anomalous Fires on N. Sentinel Island Associated with Flight MH 370? 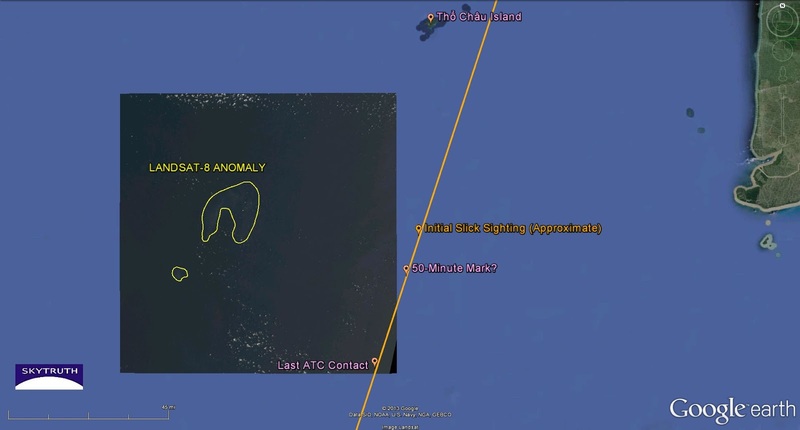 Update – 6:00 pm June, 5, 2014: The answer to the titular question is apparently “No.” The search has been narrowed to the southern Indian Ocean, far from the Bay of Bengal. 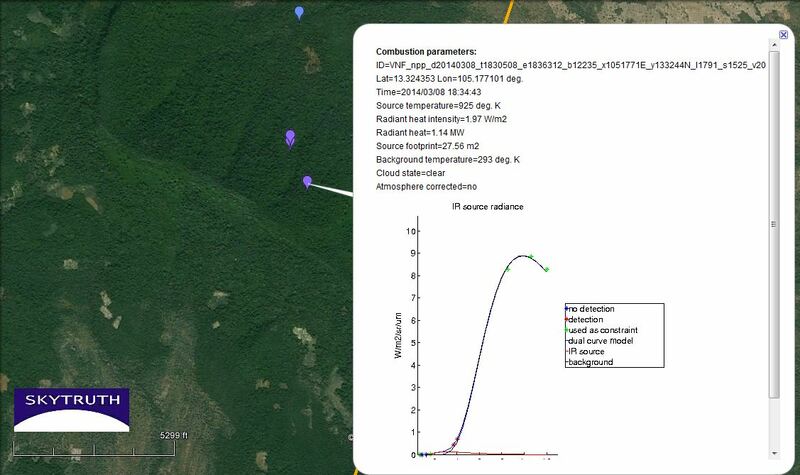 While the fires are clearly not associated with MH370, the observations described here are peculiar and possibly caused by other human activity such as illegal logging. See also our cautionary post on all the satellite images of “debris” that eventually turned up nothing. Update – 12:00 pm March 17, 2014: Clarification on nighttime fire detections. There have been a few nighttime fire detections from the island by the VIIRS instrument on March 6th and in late January. 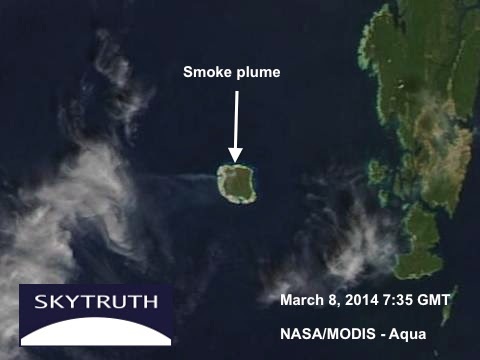 According to our review, there have been no MODIS detections of fires from this island prior to March 10th. Update – 4:38 pm March 17, 2014: Added animation from the World Wide Lightning Location Network (WWLLN) eliminating the possibility that the fires were started by natural causes. We’ve already done several posts on the mysterious disappearance of Flight MH370, mainly pointing out how many gaps there are in our observation of Planet Earth. (see John’s quote in the Washington Post). 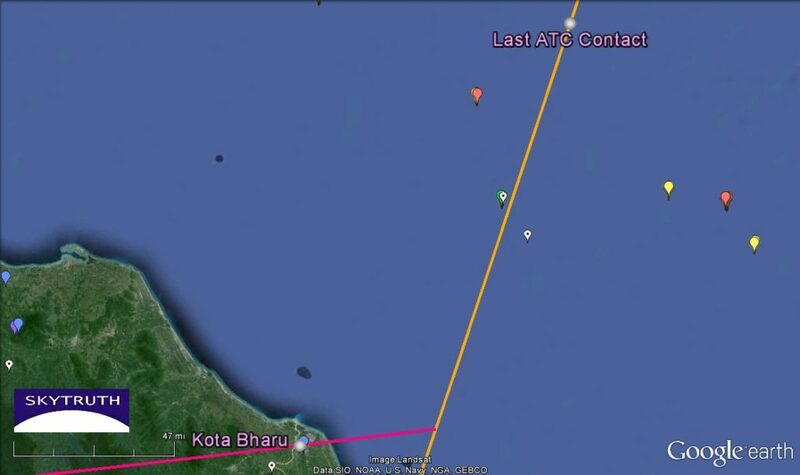 But thanks to the keen eyes of a skytruther named Emily, we have a lead on something very interesting in the Bay of Bengal that has peculiar correlation to the timeline of MH370’s disappearance. 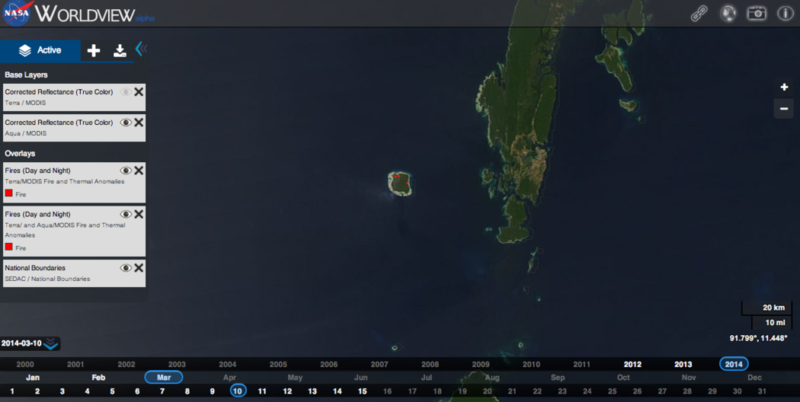 On March 8th, sometime between 12 and 15 hours after the Boeing 777 disappeared from secondary radar, a very distinct plume of smoke appeared on MODIS imagery from the north side of North Sentinel Island (part of the Andaman and Nicobar Islands Union Territories of India). The island is solely occupied by an indigenous people known as the Sentinelese who have categorically rejected almost all contact with the outside world. Except for a series of friendly visits in the 1990’s from Dr. Trilokinath Pandit of the Anthropological Survey of India, they have greeted all outsiders with a hail of arrows. In 1981 they forced a hasty evacuation from a grounded cargo vessel still visible in Google Maps, (click the link and look on the NW corner of the island) and spurned a helicopter checking to see if they survived the 2004 Tsunami. 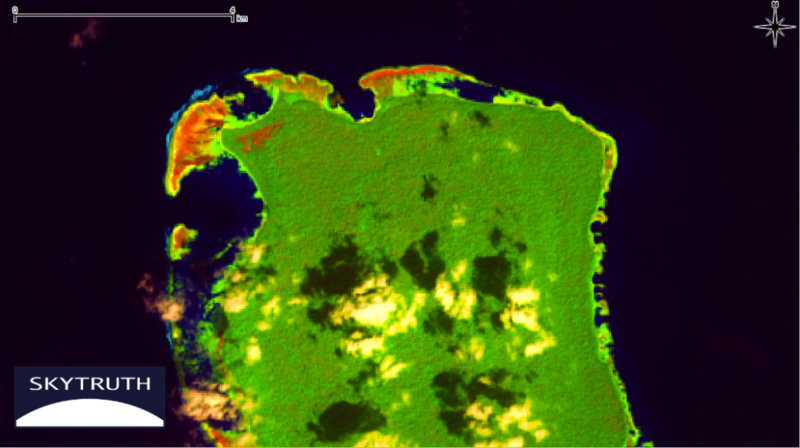 Scanning the island, it is clear the island shows no evidence of agriculture, only sand beaches and dense tropical forest canopy. Anthropologists report they are technically a stone age tribe (though they use repurposed bits of metal from shipwrecks) and while they posses fire, did not know how to make it. So back to the modern era. At 4:30 GMT, NASA’s Terra satellite recorded, as always, a quiet, smokeless image of the remote island. But a mere 3 hours later, when Aqua passed overhead at 7:35 GMT, the satellite captured this image of a distinct smoke plume. 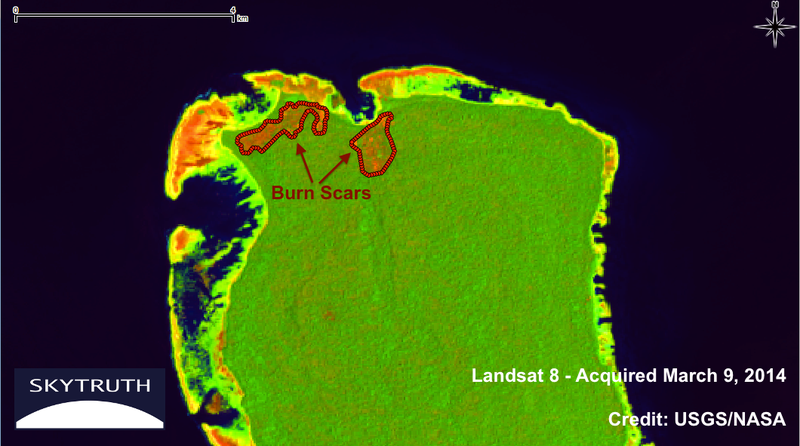 The following day, Landsat 8 acquired an image of the island, and while no smoke was visible, a roughly 40 hectare (over 123 acre) burn scar cuts into the dense interior canopy of the island.  Below you can scroll between a reference image from February 5th (on the right) and the Landsat 8 image acquired on March 9 (on the left). Click here to open a larger image with the burn scars outlined. This is a false-color (Bands 7-5-1) contrast-enhanced image, which exaggerates the reflectance of light in the near-infrared wavelengths so that healthy vegetation appears exceptionally green, while burn scars and bare earth or sand appear reddish-orange. 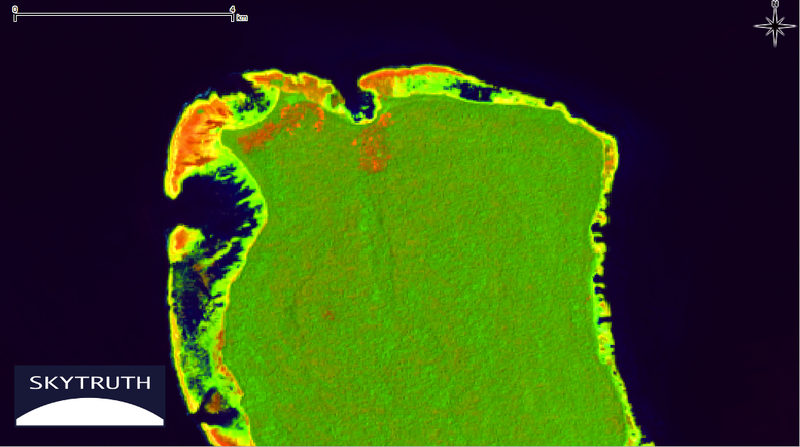 Finally, infrared sensors aboard the MODIS satellites and NOAA’s Visible Infrared Imaging Radiometer Suite (VIIRS) instrument on the Suomi NPP satellite detected fires on the north side of this island from March 8-10. We reviewed the past three months and March 2013, and found no other fires on North Sentinel Island detected by MODIS. However, there was a VIIRS nighttime fire detections on the north side of the island on March 6th, as well as a few in late January which are consistent with the coastal burn scars visible in the Landsat image from February. Could this be connected to the disappearance of MH370? Indian Naval officials dismissed earlier reports of the smoke from the island, saying it was just the natives burning grassland. Except as far as we can see on the recent Landsat imagery, and the 2011high-resolution DigitalGlobe satellite imagery of the island in Google Maps/Earth, there is no grassland on the island. Could this isolated tribe have recently reached the anthropological milestone of experimenting with slash-and-burn agriculture? 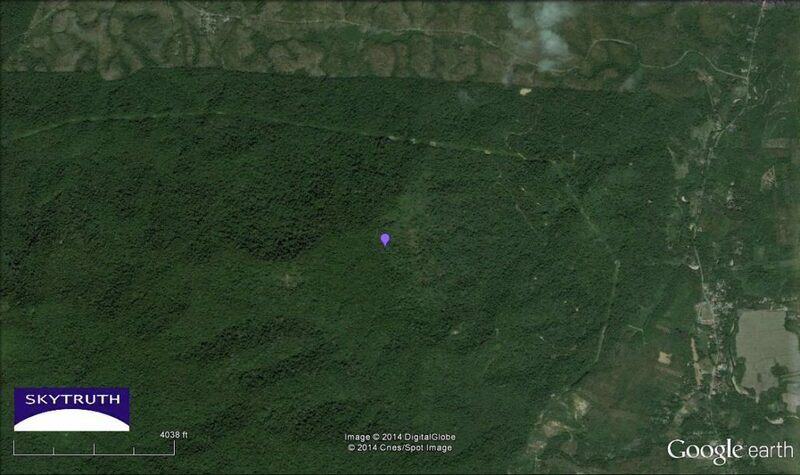 There is no obvious sign of intentional land clearing on the high-resolution imagery of the island from December 2011. Perhaps the fires were accidental, set off by out-of-control campfire. But this appears to be dense tropical jungle without any obvious historical burn scars. We’re looking into this, including trying to access a global lightning strike database so we can determine if the fire was associated with a brief but intense weather event. But please let us know what you think in the comments below. Dr. Holzworth looked as far back as March 1, but found no evidence of lightning strikes within 200 km of the island in the week preceding the fire. While he noted that no network can detect every single lightning stroke, there are no significant weather systems in the Bay of Bengal at the time in question. You can read more about the accuracy of their system in the Journal of Oceanic and Atmospheric Technology and see a visualization of the last 30 minutes of lighting strike data at – http://wwlln.net/new/map/. Don’t forget, you can check out the same imagery we use from the USGS, NASA, and NOAA, and if you are in a position to pass this along to anyone involved in the search effort who might find it interesting, please do so! /wp-content/uploads/2016/08/test_logo.png 0 0 David Manthos /wp-content/uploads/2016/08/test_logo.png David Manthos2014-03-16 19:25:002019-02-14 10:57:13[Updated] Are Anomalous Fires on N. Sentinel Island Associated with Flight MH 370? Still no sign of Flight MH370. It’s a bracing reminder that the 21st century information-and-technology blanket we’ve wrapped ourselves in still has a few gaping holes. 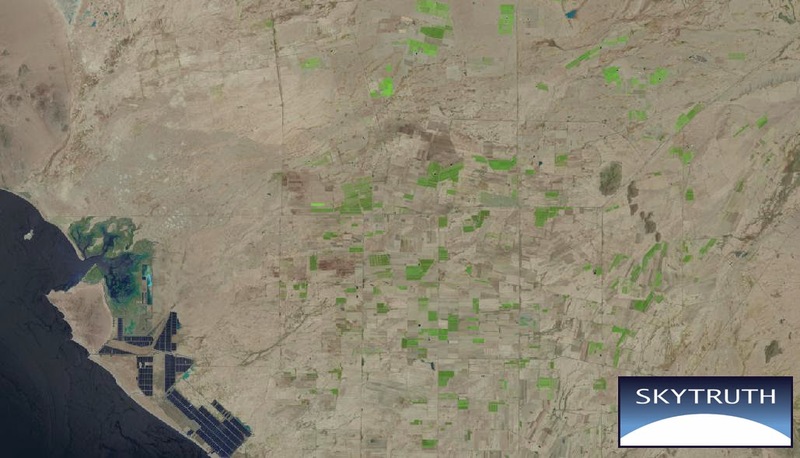 High-resolution satellite imagery isn’t yet continuous and ubiquitous – not even close. We’re still too often in response mode when something like this occurs, scrambling to deploy the information-gathering tools long after the event occurred and the evidence has faded. If somebody didn’t have the awesome foresight to program an imaging satellite, days in advance, so it was ready to snap that critical picture in exactly the right place at exactly the right time, that image never comes into existence. But we do have some pretty cool tools nonetheless. Thanks to the helpful suggestion of a SkyTruth fan (let us know if you don’t mind us sharing your name! ), we’ve been looking at the “Nightfire” nightly fire-detection product coming from data collected by the VIIRS instrument on the Suomi-NPP satellite operated by NOAA. That’s a lot of capital letters, but you’ve seen this stuff before if you’ve been following our blog. These data indicate sources of combustion, and measure the temperature of those fires. Our assumption is, if the flight went down shortly after air traffic control’s last contact at 17:30 GMT on Friday, March 7, we might see an isolated fire from that wreck site for a short period of time. Maybe one or two days if it crashed over land; less than a day if it hit the water (and didn’t immediately sink). 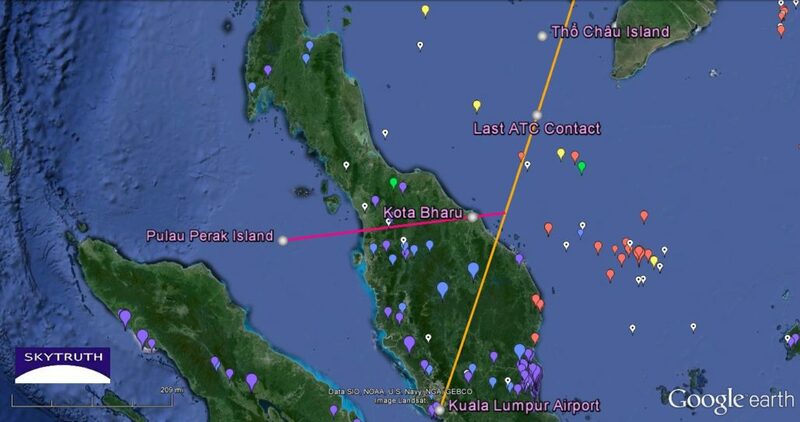 So we looked for short-term, isolated fire-detections that were in remote areas over land, or on the water, within 20 miles of the expected flight path and the western deviation implied by some inconclusive Malaysian military radar data. Some caveats and disclaimers: 1) Our work with the VIIRS data is by no means exhaustive or comprehensive. So feel free to take a crack at it yourself. 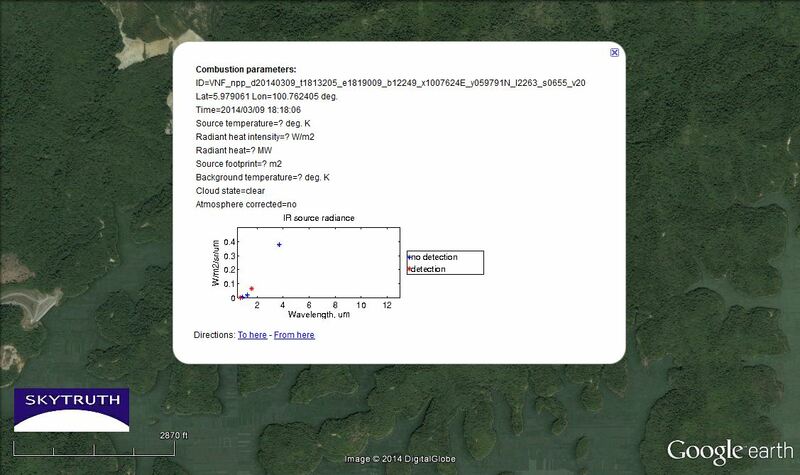 2) The VIIRS Nightfire product is still experimental, and fires can be obscured by clouds and go undetected. And this is a pretty cloudy part of the world. 3) There are lots of fires in this area: gas flaring from the many offshore oil platforms in the Gulf of Thailand, intentional fires set to clear land for farming, and wildfires. Anyway, we’ve found a few interesting things during our cursory look at the Nightfire detections. Please share this with anyone who might be in a position to actually use this information. 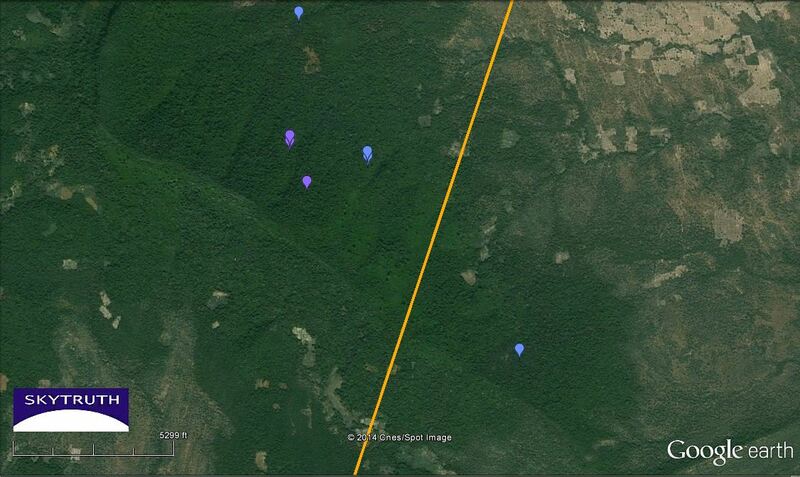 Overview showing all Nightfire detections on March 8, 2014. Bold orange line shows our approximation of the expected flight path from Kuala Lumpur to Beijing. Bold red line shows our approximation of the deviation from that flight path that was suggested by eyewitness reports of a jet flying low over Kota Bharu, and Malaysian military radar contact of an unidentified aircraft near Pulau Perak Island. Other points of interest marked and explained in a previous blog post. Detail showing all Nightfire detections for March 5 – March 11 over Gulf of Thailand. All but one of these sources (see below) is persistent, occurring on multiple days; they are probably gas flares at offshore oil platforms. Location and temperature information for the only single-night combustion source detected in the Gulf of Thailand near the expected flight path. Fire detected by VIIRS on March 8 at 18:36 GMT, 21 hours after last ATC contact with the flight. A persistent multi-night combustion source 11 nautical miles north-northwest of this location is probably a large manned oil platform. Nightfire detections of combustion sources along the supposed western deviation (approximated by red line) from the flight path. 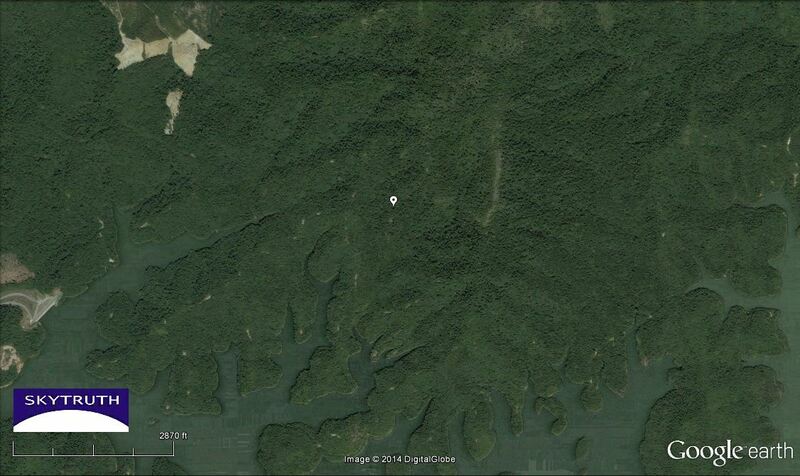 Dark green shows large areas of thick forest. Isolated, single-night combustion source on a remote peak in rugged forested terrain of western Malaysia, detected by VIIRS on March 8 at 18:36 GMT. See below for location. Location and temperature information for combustion source shown above. A second isolated, single-night combustion source in rugged forested terrain of western Malaysia, detected by VIIRS on March 9 at 18:18 GMT. See below for location. 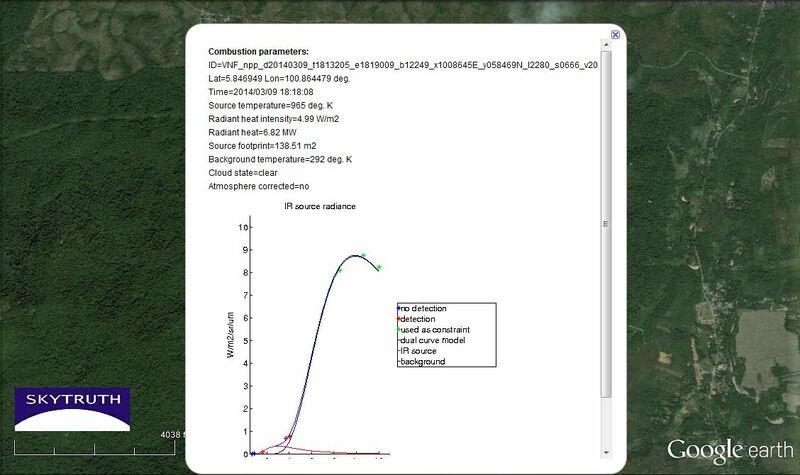 Location and temperature information for second combustion source, shown above. A third single-night combustion source on a peak in rugged forested terrain of western Malaysia, detected by VIIRS on March 9 at 18:18 GMT. See below for location. Location and temperature information for third combustion source, shown above. Nightfire detections for March 5 – March 11 along expected path of Flight MH370 (approximated by orange line) as it traveled from Kuala Lumpur to Beijing. Heavily forested areas are dark green. 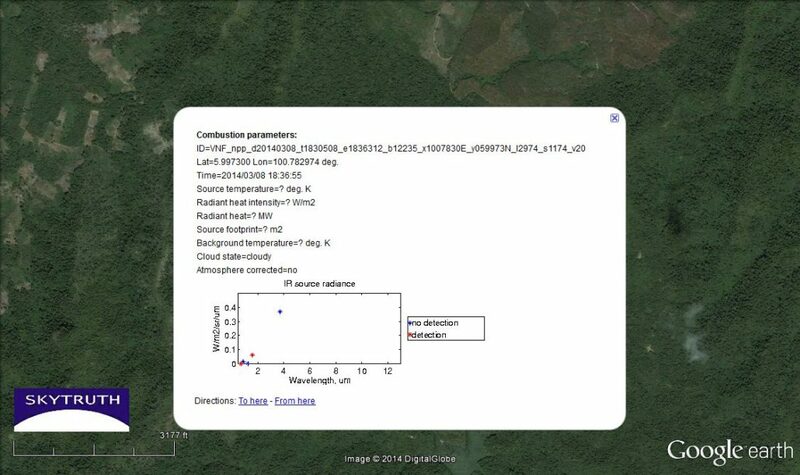 Location and temperature information for a combustion source detected by VIIRS on March 8 at 18:34 GMT, on a densely forested, isolated ridge in north-central Cambodia, shown above. We’ve turned up some Landsat-8 satellite images from the area in the Gulf of Thailand, between Malaysia and Vietnam, where Malaysia Airlines Flight MH370 went missing a few days ago. 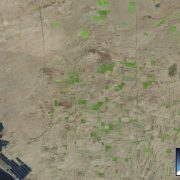 Landsat images, at 30-meter resolution, are much more detailed than the twice-daily MODIS images at 250m resolution. 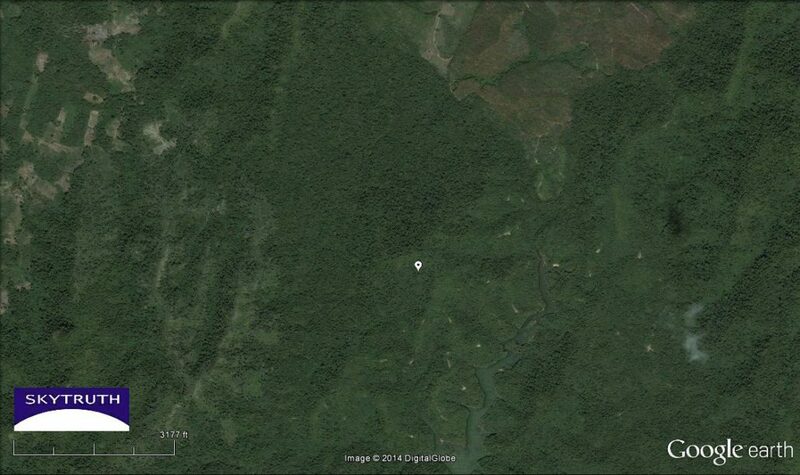 The image inset in the map below shows detail from Landsat-8 image P127/R54, taken at 03:27 GMT on March 8. That’s almost exactly 10 hours after air traffic controllers reported their last contact with Flight MH370 (at 17:30 GMT on Friday, March 7). Nothing in this image jumps out strongly. 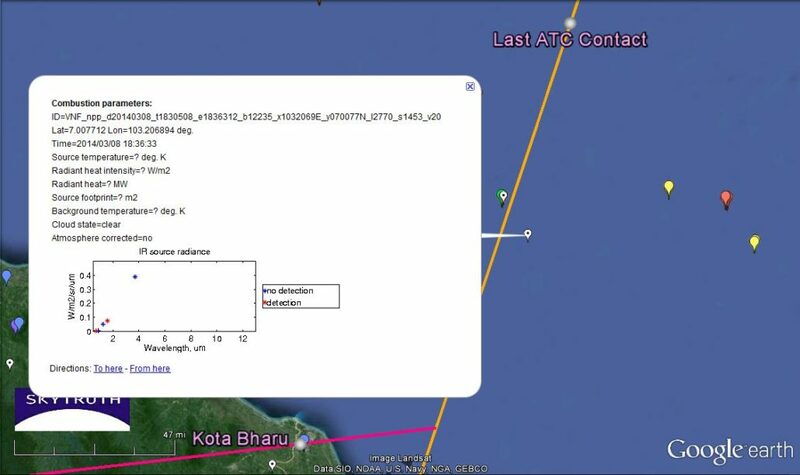 But there is a faint, diffuse, pale anomaly not far west of the general location where we estimate MH370 was when contact was lost. It appears to be horseshoe-shaped. The very approximate center of this is located at 8.551422° N latitude / 102.680976° E longitude. 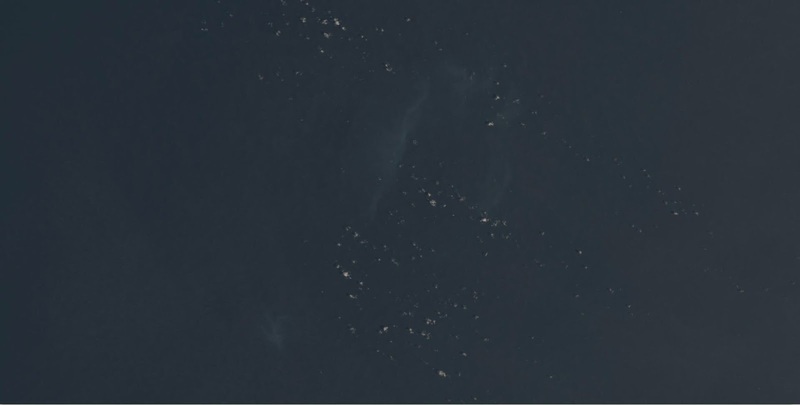 Faint pale anomaly in Landsat-8 satellite image taken 10 hours after Flight MH370 last had contact with air traffic controllers. See location on map below. Small white spots are low cumulus clouds (note their matching black shadows offset to the northwest). Detail from Landsat-8 image (inset) showing location of pale anomaly relative to our estimate of MH370’s flight path (bold orange line) and waypoints discussed in our earlier blog post.